One of the hockey team's smaller players, Connor Leen never backs away from a challenge. The pattern for Connor Leen’s life was established at age 2. His grandfather built an ice rink in his garden and Leen learned to skate there. He has an early memory of his parents bringing him to another rink where everyone was bigger than him. He started to cry and tried to leave the surface. FRIDAY: at Boston University, 7:30 p.m.
SATURDAY: at Boston College, 7 p.m.
Leen is a senior forward for the Maine hockey team, and he’s still being sent onto the ice with bigger people – without the fear these days. At 5-foot-9, 165 pounds, the native of Chester, New York, relies on his speed and grit to battle with hulking opponents. He is second on the team with 32 shots on goal and will be at it again Friday night at Boston University and Saturday at Boston College. 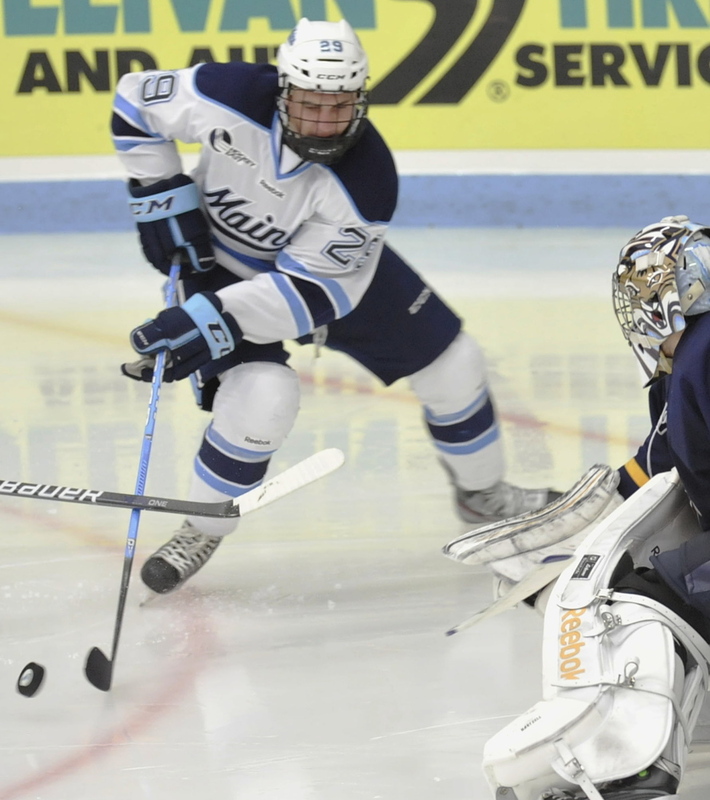 Maine (3-7-1, 2-3 Hockey East) made it a point to recruit larger players this year, bringing in the likes of 6-3, 220-pound Mark Hamilton and Nolan Vesey at 6-2, 210. Brown and Leen said they didn’t take that personally, adamant that there’s still a place for the smaller player in hockey. Leen, the team’s most explosive skater after working with private coaches since age 4, proved his value at the outset of last Friday’s home game against BU. He flew down the right side of the ice and took a shot that bounced off the pads of goaltender Matt O’Connor, who didn’t have time to recover before Leen quickly backhanded the rebound over O’Connor’s shoulder for a 1-0 lead just 1:13 into the game. As for Brown, he has put up a team-leading nine points and impressed his coaches enough with his defense to draw the primary assignment on Terrier freshman sensation Jack Eichel last week. Leen never backs away from a challenge. Guite said that frequently causes him to hold his breath while watching from the bench. Brown isn’t as fast as Leen, but he’s becoming just as adept at finding space to work among the larger bodies. He has a quick initial three strides to help him. Both skaters believe the Black Bears have been working hard, and that better outcomes are ahead. They have lost their last three games and face a daunting road trip, and Brown senses this weekend could be a turning point for his team, for better or worse. That last part certainly has never been an issue for Leen.